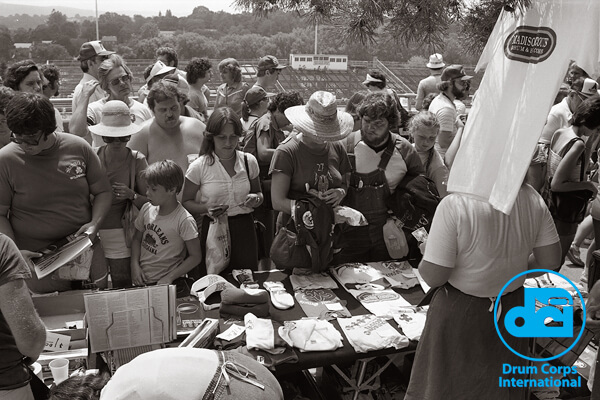 Drum corps fans shop for souvenirs during the 1980 DCI East competition at Allentown (Pa.) High School Stadium. A long day of drum corps action, both Prelims and Finals competitions took place on Saturday, Aug. 9. 25 corps performed at the popular venue that two years later would be renamed J. Birney Crum Stadium in honor of the Allentown High School football, basketball and baseball coach who was inducted in the Pennsylvania Sports Hall of Fame in 1974. Before the back sideline stands were removed in its present day configuration, J. Birney Crum Stadium was at one time the largest high school football stadium in Pennsylvania. At the 1980 DCI East Finals, 27th Lancers pulled off a win, scoring 90.35 to the Blue Devils' 89.50. Six days later the Devils would jump back ahead of 27th, winning their second straight and fourth total title at the DCI World Championships in Birmingham, Ala.
READ: 10 memorable moments in DCI East history. Photo from the Drum Corps World archives. Scanning and archival services provided by Drum Corps International corporate partner WeScanFiles.com.